Clyde Barr is back! and is still as gifted at making enemies as before. Nothing Short of Dying was one of my favourite reads of 2016, so I was hotly anticipating the sequel to the first Barr novel, and boy, has Erik Storey delivered with A Promise to Kill. Barr fits the stereotypical drifter protagonist prototype in so many ways, but the way Storey writes the characters in this novel enables their backstories and relationships to really come alive. Barr has a difficult time maintaining relationships, and that really does come through in A Promise to Kill. Barr finds himself helping the Ute people, who are a group of Native Americans, to protect themselves from a group of outlaw bikies that have blown into town. Things quickly escalate and get out of control, and Barr is forced to go to war to protect his new found friends. The plot in A Promise to Kill is interesting, but nothing too out of the ordinary. There were no surprise twists or unanticipated endings, but an action packed, adrenaline filled sequence of battles and complications that kept the reader engaged and thirsting for more. Storey navigates his plot in a succinct manner, only providing brief snapshots of setting and characterisation and focusing heavily on action and driving the plot. To me, that’s fine, because I’m here for the thrills. Although A Promise to Kill can be read as a standalone novel, I highly recommend starting this series with Nothing Short of Dying, which in my opinion remains one of the best debut thrillers out. It really helps connect the reader to these characters and especially Clyde’s backstory, if you know what happened in the previous book. If I hadn’t read the first book in the series, this book would have been less enjoyable, as some of the comments and actions that Clyde makes can seem a little strange unless you understand where he is coming from. I’m hotly anticipating the next book in the Clyde Barr series – and definitely will be reading it when it comes out. I’d recommend this series to fans of Lee Child, C.J. Box and Ace Atkins – the readers of those long standing series will really enjoy the plot, setting and style of the Clyde Barr novels. Just remember to start with Nothing Short of Dying. So… I decided to do some tracking here on the blog. I’ll just be updating this post with any of the challenges and check ins that actually happen. Where in the world are you reading from this weekend? Have you done the 24in48 readathon before? 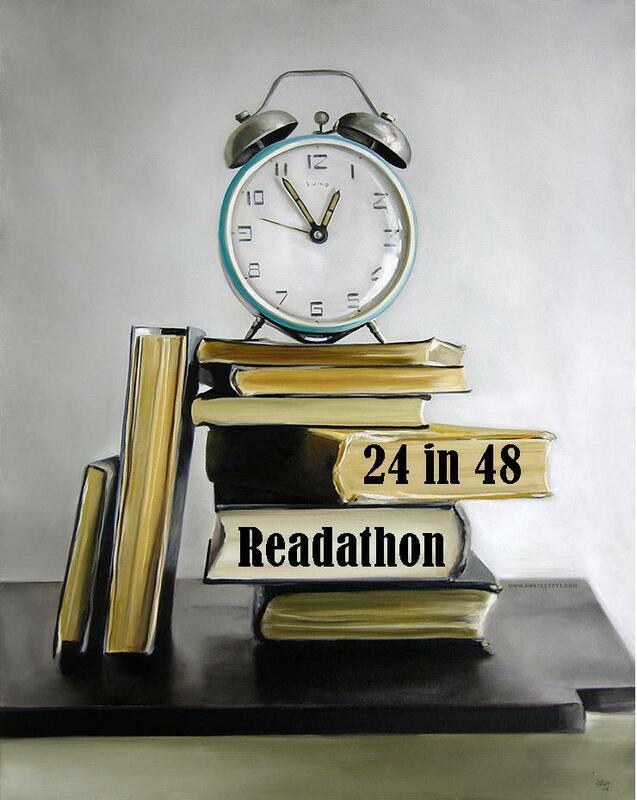 Where did you hear about the readathon, if it is your first? I heard about it on twitter, a year or so ago. What book are you most excited about reading this weekend? Off Reservation by Bram Connolly, it’s by a local author and I loved the first book in the series. I never know what to write for these sections. Remind us where to find you online this weekend. The Awakening by Kate Chopin, Dover Thrift Kindle Edition, 1899, 195p. I had no idea what to expect going into The Awakening, I’d heard that it was a feminist novel and quite different for its time, but I was shocked at how much I enjoyed it. I’m not sure if I would class this as a full blown novel, as it was quite short and seemed more like a novella in structure and tone, but that’s certainly not a detraction from this amazing book. Chopin’s style is crisp and easy to understand – this is one of those novels that reads easily and without struggle. I read three quarters of this novel in ebook format, and listened to ten chapters in audiobook format. The audiobook seemed slower, while the ebook was much easier for me to follow. That’s most likely because I’m accustomed to reading as opposed to listening, but it was nice to be able to read while doing housework. I would have loved for The Awakening to have been a little longer, maybe for the affair to have developed more before the devastating ending occurred. Also, while talking about that ending – how heartbreaking! A more astute reader could have come to understand what the ending of the book would be half way through, but I was delightfully unawares and did not expect or suspect it! Which lead to me freaking out and yelling to the significant other what had just happened. Heartbreaking. Uh. Chopin – you brilliant writer, you completely trampled my emotions and now you’re returning them worse for wear. I’m not giving you back your deposit. Agnes Grey by Anne Bronte, Penguin Classics Edition, 1847, 251p. So… this is a very belated and short review of Agnes Grey by Anne Bronte. I read Agnes months ago, enjoyed it, but never got around to my review. Usually, I wouldn’t bother reviewing so late, but I am making an effort to review all my Classics Club books. This is my favourite work from the Bronte sisters that I have read so far. Jane Eyre was enjoyable and interesting if long winded, while Wuthering Heights nearly drove me to suicide. I was a bit worried when approaching Aggie, but I dove in headfirst. There’s something intriguing about Agnes’ character. I identified with her, and thought she was very well written. She is certainly a product of her time, and reading this book as a historical text is really interesting. I think that I will take the time in the future to reread this text and try and dig a little deeper into the social context that is so interesting. As a commentary on religion at the time, Agnes Grey is really telling. It’s so different from how we regard religion in common times, and as an atheist, seeing how religion is disseminated into all aspects of life is interesting and slightly scary. The romantic interest is deeply entwined in the church and that is strange because I don’t think you see that in mainstream modern novels. I enjoyed Agnes Grey, but I wasn’t blown away by it. I will be looking for other works by Anne Bronte, because I enjoyed her writing style. Top Ten Most Anticipated Releases in the Second Half of 2016. I’ve included releases from July, August and early September. I’ll probably do another list similar to this in late August/early September when more release dates are available. One of my favourites, Geoffrey McGeachin’s Charlie Berlin series, will be due for a new book soon, but so far I haven’t heard anything about it. Sean Black’s The Edge of Alone – July 10. The 7th in a great series about Ryan Lock, who works in private security but always seems to find himself in deep trouble. Already pre-ordered. Scott McEwen’s Ghost Sniper – July 12. A favourite series of mine, and one of the few American military fiction authors who I don’t want to give a lesson on tolerance to. His characters are real, but so so tough. Will buy on kindle. Ace Atkins’s The Innocents – July 12. I’m hoping that this one can recapture the awesomeness that was the early releases of this series. Has one of the most memorable sidekicks ever written in Boom. Netgalley copy. Alex Kava’s Reckless Creed – July 26. Cute series about a man (called Creed) who trains service dogs. They are still thrilling, but I will admit to reading mostly because of the dogs. Jack Coughlin’s Long Shot – August 16. Excellent series about a sniper – was the first American military fiction author that I ever enjoyed. The last book made some questionable choices regarding characters and who would be featured in this book, but I’m waiting to see how this one turns out. Will order from library. Erik Storey’s Nothing Short of Dying – August 16. I’ve already read this one! AND IT WAS SO GOOD. Expect more fapping, more hyping and lots of 5 star reviews for Nothing Short of Dying. Best thriller debut of 2016, hands down. Netgalley copy. Chris Ryan’s Bad Soldier – August 25. The Fourth book in the Danny Black series. Each one is just as good as the previous release – all have been four star reads for me. Black is a believable character who you can’t help but root for. Will order from library. David McCaleb’s Recall – August 30. I’ve never read McCaleb’s work before (he might be a debutant for all I know), but I saw Recall on netgalley and immediately wanted to request it. I’m trying to get ahead of my reviewing queue before I request any more, but this is high up my list of anticipated new releases. Netgalley/kindle copy. William Kent Krueger’s Manitou Canyon – September 6. Kreuger writes atmospheric thrillers, of which I have read three or four, but I am so behind on the Cork O’Conner series I know I should just pick up the next book in the series and read my way up to these new releases. Top Ten Tuesday is a meme hosted by the lovely peeps at The Broke and The Bookish. Every week the challenge is to list 10 things/books of a certain theme/question. So – if you have been hanging around Ranty Runt of a Reader for any period of time, you might have observed that I LOVE readathons. Here’s my list of 9 things I love about readathons, and one thing I dislike about them. I read all the things. During a week long readathon, I usually finish between 4-6 books. That’s the same number of books I would normally read in a month on average. In a 24 hour readathon I might knock off a book and a half. Readathons force me to read different genres. I read lots of thriller novels – I’d say 75% of my reading would fall in the thriller genre. But if you read six thriller novels back to back, things can get repetitive, boring and slumpy. Normally, I would include a classic and something sci-fi or fantasy themed in my TBR. If I read a romance – chances are it was during a readathon. They usually are flexible with book choice. I don’t read YA or romance – and many book blogging events revolve around those two genres. Readathons generally don’t force you to read a certain genre/book, so I feel I can participate equally with those who DO read those genres. I get excited to read. During a readathon, I need to strategically prioritize reading over other things, like hobbies, TV and work. I’m excited to add to my page count, to finish a book, to review a book. During a readathon, I’m more excited about everything. I meet new bookish people. Readathons usually have a sign-up link, and part of my preparation for a readathon is to check out other people’s blogs and friend them if I find them interesting. It’s also great to meet people who blog about different authors/genres. They provide a hook to my blog. Sometimes, I don’t post as regularly as I would wish. I program the dates of readathons into my phone (especially the bigger events) and even when I’m not feeling like blogging, a readathon will at least get me to crack open a book. Also, most likely lead me to reading other peoples blogs, and then I provide my own with some love. They are events that hook me back into blogging. They provide different content. Sometimes blogging can start to feel stale. When I first started, all I did was reviews, and that became old quick. Readathons provide something else to write about, but doesn’t require much research or preparation. Challenges within readathons are GREAT for this. Readathons continue blogging traditions/memories. Some of the more established readathons have become institutions within the blogging community. Events like Bout of Books have been running for so long that it seems like my calendar is divided into the three parts of the year between ‘thons. Also, Dewey’s 24hr readathon keeps the memory of a passed blogger. This is all important for our community. I get students to read in class. When I am teaching, and a readathon happens to be at the same time, I tell ALL my students about the readathon. Then when it’s time for silent reading I inform students that it’s my readathon time and then we see how much we can read. And number 10. I always find out about readathons too late. I constantly find wrap-up posts/videos or update posts from during the readathon. I know there’s a couple blogs out there that try to keep track of these things, but so far no list I’ve found has been that comprehensive and kept up to date. Am I missing a resource here? Are you hosting a readathon? Let me know. Do you love them as much as I do? Do you hate them (are you even human?)? Why?